Concrete countertops are an increasingly popular choice, not just for kitchens, but also baths and other areas of the home. Not only does concrete look great, but it also offers a range of additional benefits for buyers. Let’s take a closer look at three of the leading advantages of choosing concrete for your next project. Concrete has long been used for roads, sidewalks and foundations because it is a durable product. This durability is still a considerable advantage when concrete is used for countertops. Concrete counters are resistant to cracking, chipping and scratching, and they are also highly resistant to stains once sealed. In fact, a concrete counter that is properly maintained can be expected to last for decades or longer. Concrete counters provide an amazing degree of flexibility. These counters can be used in kitchens, bathrooms, home bars and more. They can also be built in many different sizes to accommodate the rooms in your home. Concrete counters can be made in nearly any color by adding pigments, while the surface can also be styled with stains to create a unique appearance. They can also be created with embedded tile, shells, glass, and more to create a unique, one-of-a-kind counter. Concrete can also be shaped and formed to meet the needs or any space. You can have a completely custom counter that fits perfectly and uniquely complements your home. Whether you need a straight counter, an L-shape design or even a wavy S- or C-curved surface, the flexibility of concrete counters makes them perfect for nearly any room in the home. 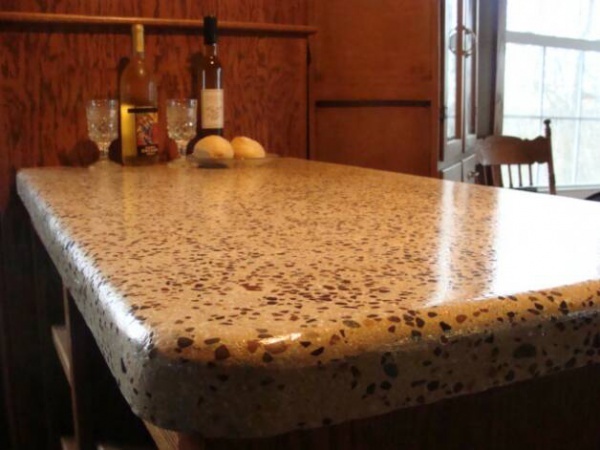 Concrete counters cost a bit more than some other traditional materials, but when you consider the made-to-fit convenience and long life span, they are absolutely one of the most affordable options. Since concrete counters may last for decades, the overall lifetime cost of counters is quite low. Other counter options may be cheaper, but they will typically need to be replaced several times during the life of a home. Concrete counters are a lasting investment, and can provide decades of service in your home. Templin Concrete Construction specializes in concrete counters and decorative concrete. We are committed to providing the best quality at the best price. Contact us today at 612-388-1945 to learn more or to request a quote for your next project.